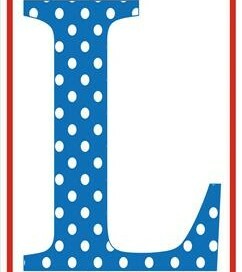 Unlike the book Put Me in the Zoo, the spots on these polka dot letters don’t change colors, but the letters do! 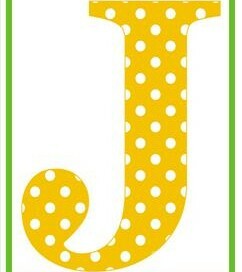 Primary colored printable uppercase letters will add some spice to your walls. You or your kids point to them and practice saying the letter names and their sounds. As an added bonus, you can have the kids name the primary colors. 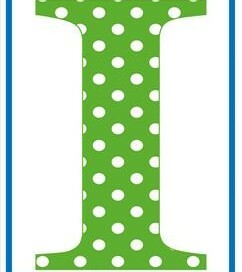 Go to this page to see the coordinating polka dot lowercase letters or this page to see more alphabet letter sets. 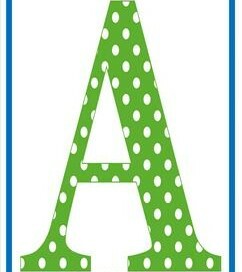 From my collection comes polka dot letters uppercase A spunky and fun in green with white polka dots and a classic blue frame. She’s sure to dress up your walls & make you smile. 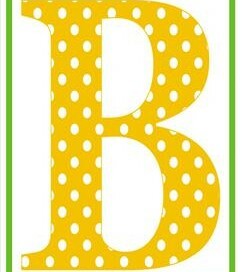 Big, bright, and bubbly, from my polka dot letters uppercase B comes shining like the sun with a green frame reminding me of… the green crayons in the crayon baskets! 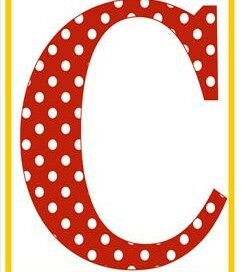 Polka dot letters uppercase C makes me think of retro themes in its fire engine red with white polka dots. A firm yellow line all around frames the C very nice and cozy-like. 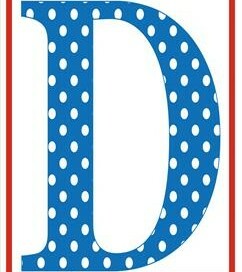 Polka Dot letters uppercase D reminds me of the fourth of July standing tall in patriotic colors of red, white, and blue. I’m a Yankee Doodle Dandy…oops, caught me singing! 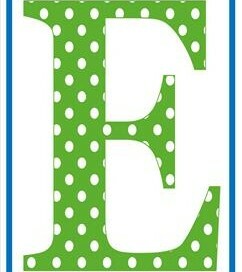 Here you find my polka dot letters uppercase E in my favorite colors of blue and green. How will you use this letter in your classroom? By singing about epples and benenes? 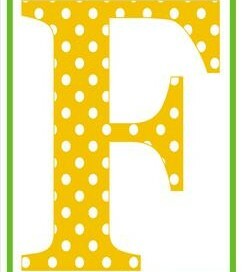 Another one of my bright and cheery polka dot letters uppercase F has come your way to brighten your day and cheer you on to fun, fun, fun and even more fabulous fun! 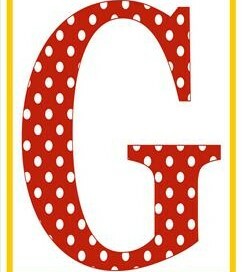 Looking at this polka dot letters uppercase G you can’t help but think of things that are good, great, and grand! 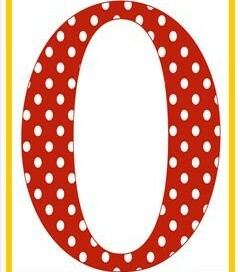 White polka dots in a fiery red G with a yellow frame – think golden arches! 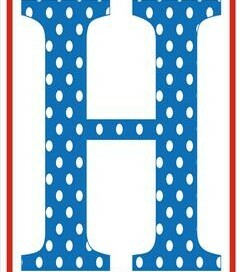 How can you not be inspired to be happy when looking at this polka dot letters uppercase H? In a beautiful blue, with a bold red frame – sure to brighten up any space! Standing tall (and I might say a little bit plump!) this polka dot letters uppercase I stands like a guard at watch. Too bad with those spots he can’t be taken too seriously! 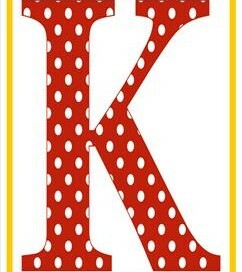 Polka dot letters uppercase K looking red hot. Makes me think I’d like to be KISSING someone (but not in a tree! ), arms wrapped around like the yellow frame in a big hug! 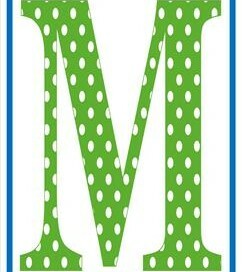 Polka dot letters uppercase M looks very motherly standing tall and watching over you. Does she look a little bit mean? MOM – Mean Old Mom – yet always has the very best in mind! 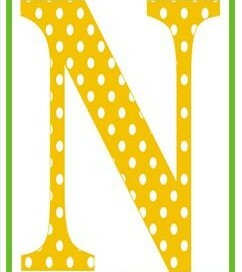 Polka dot letters uppercase N is kind of like everyone’s favorite Nana. She’s kind and gentle and ready to spoil the kids rotten! Yellow with white dots, sweet like Nana’s candy. 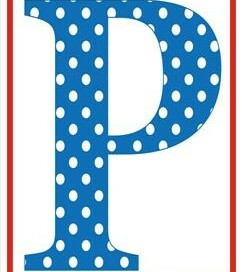 /P/ Polka dot letters uppercase P is ready to help you /p/ practice your letters! Just helping you to /p/ prime the /p/ pump for all the /p/ puffy p’s you’ll /p/ produce.